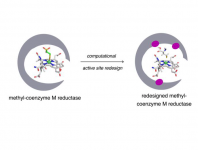 The team from Arzeda will use computational enzyme design tools and their knowledge of biological engineering and chemistry to create new synthetic enzymes to activate methane. Organisms that are capable of using methane as an energy and carbon source are typically difficult to engineer. To address this challenge, Arzeda will develop technologies essential to creating modular enzymes that can be used in other organisms. The team will combine computation enzyme design with experimental methods to improve enzyme activity and help direct methane more effectively into metabolism for fuel production. Arzeda's new enzymes could transform the way methane is activated, and would be more efficient than current chemical and biological approaches. If successful, Arzeda's enzymes will efficiently activate methane for cost-effective fuel production, and could also be applied to a variety of other synthesis processes for fuels and chemicals.